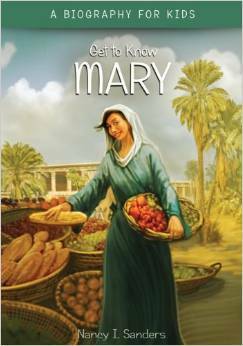 Another great biography for kids, Get to Know Mary by Nancy I. Sanders, didn’t disappoint. Although less is known about Mary than about many other Biblical figures, Nancy Sanders does a great job of painting a picture of who Mary was and what life was like for her. This book talks about the life of Mary, the Annunciation, Mary’s family (including Elizabeth, the mother of John the Baptist) and Mary’s engagement and marriage to Joseph. It recounts the Savior’s birth. It gives an overview of the culture that existed when Mary lived, including the town of Nazareth, their faith, holy days and other things that help you picture the setting that the Christ child was born into. The book also talks about Christ’s life and death, how Mary dealt with raising the Messiah, and Christ’s crucifixion and resurrection. I really liked this book. Like Ms. Sanders’ other biographies for kids, this one has a timeline of Mary’s life, a glossary, selected bibliography, source notes and student resources. There are plenty of stepping-off points for further study! This book had color maps, archaeological facts and Scripture references as well. I am anxious to see the next biography that Nancy Sanders has written for children!